In this article the author makes a comparison of the works devoted to the theme of the civil war and the revolution, analyzing the structural gradation of the epic Sakha poetry. Poem-prediction “Shaman's dream” is equated to the indigenous discovery of new contexts, compared with the approaching revolutionary situation. The civil war is shown as an unavoidable continuation of the revolutionary events in Russia (poem “Conversation of the Holy Mountains”). The tragic ending and renunciation of the “false wisdom” is the theme of the “Red Shaman”. The idea and the philosophical foundation of the works are encoded in the titles of the poems. Bu çalışmada yazar, iç savaş ve devrim konulu eserlerde epik nitelikli Saha şiirin yapısal derecelendirmesinin karşılaştırmalı analizini yapar, Yazar “Şaman rüyası" ;"Kutsal Dağlarla Konuşma", "Sahte bilgelik", "Kızıl Şaman" gibi eserlerden hareketle çalışmasını ortaya koymaktadır. Eserlerin fikir ve felsefi temelleri başlıklarında kodlanmıştır. poem, genre, symbolic images, drama of time, the author's subtext. şiir, tür, sembolik görüntüler, zaman dram, altmetin yazarları. Baldanov S.G. Obshnostj literature narodov Sibiri. – Ulan-Ude, 2001. 199 s.
Baimov R.N. Velikie liki I literaturnye pamjatniki Vostoka. – Upha, 2005. 493 s. Vasiliev G.M. Jarutskoe stikhoslogenie, - Yakutsk, 1965. 125 s.
ISNAD SivtsevaMaksimova, Praskovya . "МИФОПОЭТИЧЕСКИЕ ОБРАЗЫ КАК РЕАЛИИ ВРЕМЕНИ В ПРОИЗВЕДЕНИЯХ ЯКУТСКИХ КЛАССИКОВ". 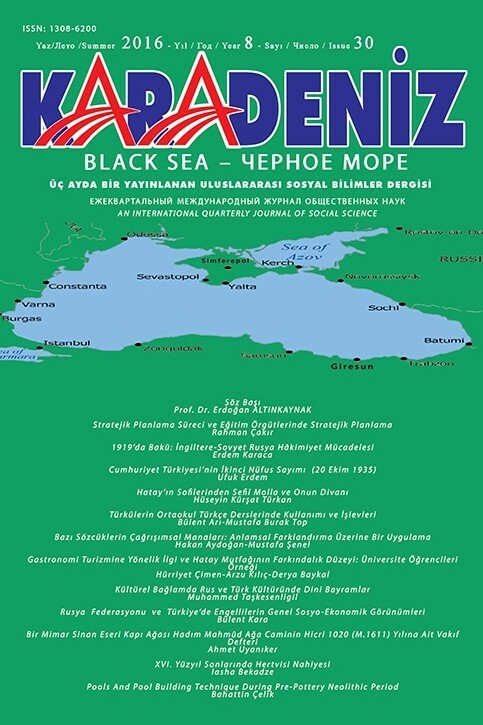 Karadeniz Uluslararası Bilimsel Dergi 1 / 21 (July 2014): 24-33.